Duplicate records can be made by playing the original recording on a separate turntable and connecting the pick-up to the microphone input terminals of the recording system. This process can be repeated until the original record becomes noisy or drops off materially in fidelity, but naturally the process involves considerable time. A number of firms offer inexpensive record pressing services to small recording studios or to persons requiring several copies of any particular recording. 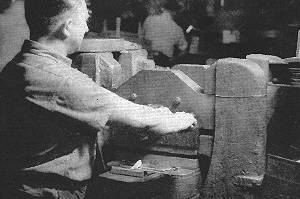 The process used is much the same as that followed in making ordinary phonograph records. The surface of the original cellulose coated disc is made electrically conductive by spreading over it a thin layer of an extremely fine conducting powder such as graphite. The disc is then placed in an electroplating bath and copper plated to a thickness of approximately 1/16 inch. The copper covering is then carefully removed from the disc and placed in a special hydraulic press, where a plastic material is pressed into the grooves of the disc and then hardened by steam and heat treatments to produce an exact duplicate of the original recording. Practically any desired number of duplicate discs can be made from this master copper disc. When records are to be duplicated by this process, record on only one face of the record and allow ample margin inside and outside of the recorded area on your disc. Duplicates can be also made when the original recording is on an aluminum disc.